!Solenidiopsis tigroides (C. Schweinf.) 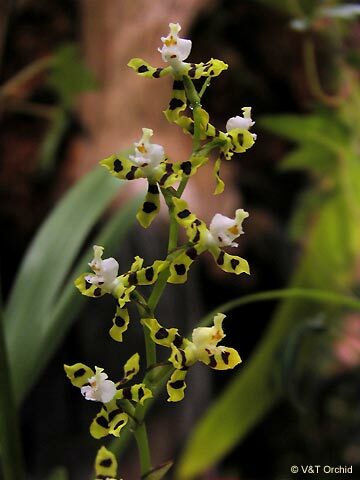 Senghas 1986 Photo courtesy of Tien Pham of V&T Orchids. 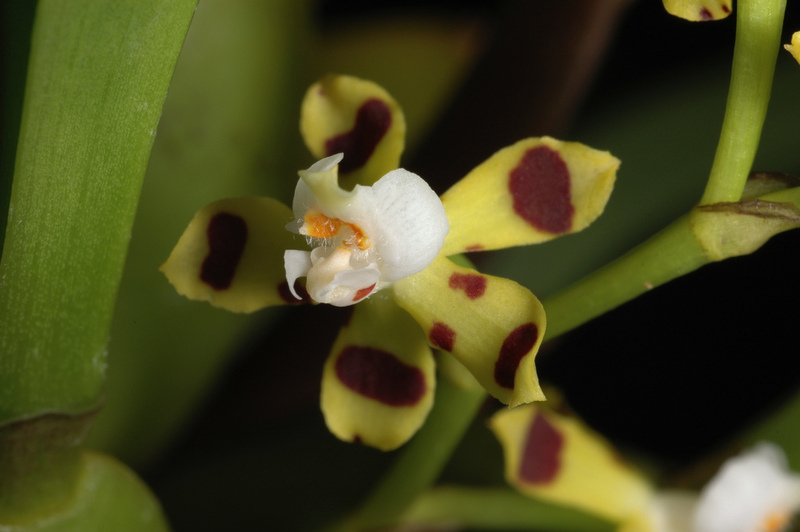 This orchid occurs on the eastern slopes of the Andes in Peru on mossy trees at elevations around 1800 meters as a miniature to small sized, warm to cool growing epipphyte with narrowly ovate to pear-shaped pseudobulbs enveloped basally by 2 to 3 pairs of distichous, imbricating, lower leafless uppermost leaf-bearing and carrying two to three, apical, oblong, rounded apically, gradually narrows below into the conduplicate, petiolate base that blooms in the late spring on a basal, suberect, to spreading, then arching to pendulous, stout, 8 to 14" [20 to 35 cm] long, many flowered inflorescence arising on a newlyu matured pseudobulb through the basal axil of the inner sheath and carries fleshy, nonresupinate flowers that have a very pleasing scent.